Desert storm, blizzard, hurricane, rain, overcast, mist, snow, and sun. All different weather conditions. From the extreme to the daily they all affect the way we dress, and the garments have just the same spectrum off difference as the weather effects themselves. 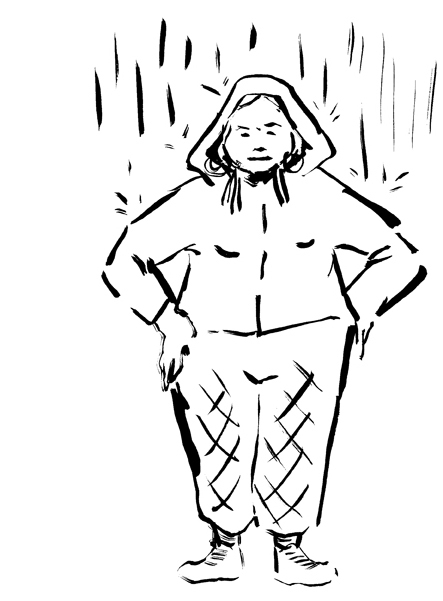 Some strive to challenge the weather by dressing fashionable or delicate. I was more teased by their counterpart; the ones that never complain, instead wear comfy clothes and who’s clothes’s form follows function. Their occupation may vary but their way of dressing makes no weather bad. I started sketching in my mind, on paper and with materials. Building a tent for my thoughts to gather in. The materials I used was of a similar kind from what tents are constructed of. Plastic and synthethic fabric sewn together by hand to form some sort of shell and shelter from weather abuse. In the process I was inspired by certain type of insects who truly change their biological structure and appearance through the various life stages that they go through. I could see a similarity in the way people dress and undress from practical to unpractical that corresponded to the way insects evolve. Although the similarities was quite apparent I didn’t want it to be in the visual presentation of my outfit. Instead in my early version of the garment it’s wearer rolled in to it while lying on the floor. It was as though the caterpillar spun its body with silk for a transformation. Just as the silk hardens and loses its transparency, so did mine. The first try-outs were all built of see-through plastic but the final result was all made out of a red sheet of tarpaulin. Cut in pieces and sewn together with a machine. The handy-craft garment changed over to sturdy mass-produced work-wear. And it is just as tough as it looks. All thanks to the material properties of the tarpaulin; being at one hand flexible, easy to work and move in, it is still sturdy enough to not break and it isolate its wearer from pouring rain. Worn with little in-under and the design lets air move easily in and out of the outfit which make you arrive free from any odor. At the same time all pieces are big enough for you to pack yourself with many layers of clothing underneath their resistant plastic layering. With this outfit you are set for anything, no matter the weather.